Arduino Blog » 20 Arduino ZERO Dev. Edition available for beta-testing – Join us! How long can you store food for? Just measure its water activity! 20 Arduino ZERO Dev. Edition available for beta-testing – Join us! 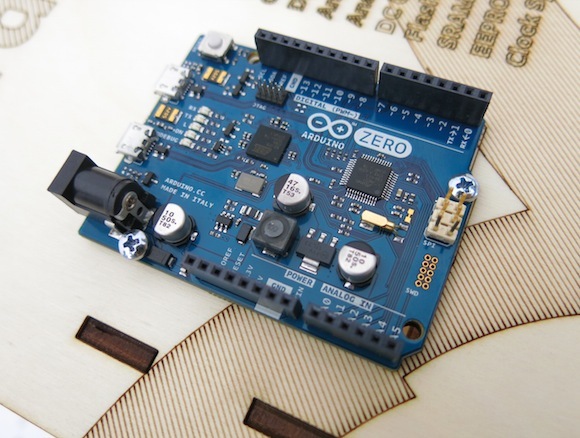 The Arduino Zero, developed in collaboration with Atmel, is a simple and powerful 32-bit extension of the platform established by Arduino UNO. The Zero board aims to provide creative individuals with the potential to realize truly innovative ideas for smart IoT devices, wearable technology, high-tech automation, crazy robotics, and projects not yet imagined. The board is powered by Atmel’s SAMD21 MCU, which features a 32-bit ARM Cortex® M0+ core. After the great experience we’ve been having with the beta-testing of the the Arduino TRE, we are happy to announce that starting today a limited batch of 20 Arduino ZERO is available for people wanting to join us in the process of beta-testing it.. The ideal beta-tester has time and interest in working on some specific issues we hope to accomplish with the beta-testing: we set up a list of tasks including writing examples, testing libraries and external hardware, and making projects that can be completed in a variety of timeframes. Ultimately our goal is to make the ZERO welcoming to non-technical customers and useful for tech-savvy customers at the same time, like all of our products. To that end, we’d like feedback from you, as beta testers, about where we could simplify for beginners and explain or document better. If you want to take part and feel you can spend some time on it, fill this application form by the 17th of August. By the 21st of August we are going to contact 20 people out of those filling the application. They will receive a coupon to get the Arduino ZERO Developer Edition for free on the Arduino Store. We will also send them an invite to a Basecamp project where they can get started with the program and sign up for tasks and projects according to their interests, skill-set and time availability. The beta-testing phase is going to last 1 month (ending around the 20th of September). Feel like joining us? Fill the form now! I know people have been asking, The Amtel “A06-0736” chip on the Zero board is a EDBG “Embedded Debugger”. That is an interesting addition. 🙂 Details can be found on the chip by searching the Amtel site for “EDBG”. One of the first links is the User Guide for this chip. When will the Arduino core for the SAMD21 be made available? “Wholder” since Atmel had signed with ARM-Med project for IOT I’m afraid you are right. This seems like a pretty exciting board. If this were available right now, I’d buy it.